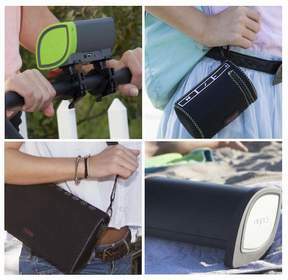 OXNARD, CA--(Marketwired - Mar 19, 2014) - NYNE, an innovator of lifestyle inspired audio products, announces that its 2014 line of portable Bluetooth speakers is ready to hit the road. The entire lineup, consisting of four speakers with advanced sound and features, is geared for active, on-the-go people, who are out for a day or night of fun. The units are mid-priced options that don't compromise on quality. "When we say these second generation Bluetooth speakers are ready to hit the road, we mean just that," said Arman Arami, president of NYNE. "They are perfect for virtually any social setting anywhere in the world, whether it's an impromptu party, a day at the beach, tailgating before the big game, or on a trip abroad. There is even a unit for the young crowd just developing its musical tastes." The Bass is the largest NYNE speaker, yet remains portable with a hidden carrying handle. With 10 hours of playtime and 20 watts of power, it's like a boom box for today's generation. It features Bluetooth 4.0 and near field communication (NFC) that let anyone share a song directly from their smartphone in seconds. It has a built-in microphone and power bank. The Bass comes with an international AC adapter with four international plugs making it an ideal way to get the fiesta started virtually anywhere. It's available in two color combinations. Lightweight and easy to transport with a carrying case, the NYNE TT is equally at home on the other side of the globe as it is on a local day trip. Packed with 16 watts of powerful sound and Bluetooth 4.0, the TT features near field communication (NFC), a built-in microphone, USB charging for a mobile device, 10 hours of playtime, and an international AC adapter with four international plugs. It is available in two color combinations. Designed for your next ride, the NYNE Cruiser comes with handlebar clips that mount to a bike, exercise machine, or even baby stroller for on-the-go music enjoyment. The Cruiser features Bluetooth 4.0, near field communication (NFC), a built-in microphone for incoming calls, 10 hours of playtime, 10 watts of power, and a battery that will charge a mobile device while you're out -- cruising! Available in four colors to match your cruising toy. Small and lightweight, the NYNE Mini portable speaker is designed for tweens and teens that want to share their tunes with friends. Its carrying case with hook clips the speaker onto backpacks, keeping phones neatly tucked away. It features Bluetooth 2.1, a 3.5mm aux-in port, built-in microphone, and 5 watts of power. Available in four teen-approved color combinations. NYNE's 2014 Bluetooth speakers are available now at regional retail stores, including BrandsMart, Dearden's, Focus Camera, Huppin's, and World Wide Stereo; online at WWStereo.com and OneCall.com; and in consumer catalogs such as Sharper Image. Retail prices are: Mini $49.95, Cruiser $79.95, TT $129.95, and Bass $149.95. NYNE, a lifestyle inspired audio brand, is part of California-based BOSS International Group (BIG), a leader in mobile audio products for more than 25 years. NYNE designs and manufactures its audio products to enhance the enjoyment of music by today's connected consumer, wherever life takes them. A collaboration of a group of Silicon Valley veterans, acoustical engineers and audio experts with a passion for technology, NYNE is dedicated to producing high-end, quality products with superb acoustics and unparalleled technology integration. NYNE portable Bluetooth speakers for music lovers leading an active lifestyle. NYNE president Arman Arami shows their new Bluetooth Speakers at CES 2014.